Getting aftermarket tinting on dive masks? 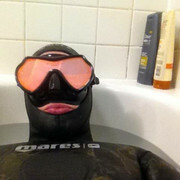 Re: Getting aftermarket tinting on dive masks? Just curious why do you like the tinted masks? Sun glare at the surface? Just curious, I was taught to avoid them, that way when surfacing your partner can see your eyes for black out or any problems. Yes, I mainly like it for reducing sun brightness/glare at the surface. Last weekend with the clear mask I got a bad headache on the paddle out from sun glare and have never had that problem with a tinted mask. I also feel like the amber tint does help increase contrast underwater and, except for the worst visibility conditions, I don't mind a bit of darkening (especially since I always dive with a light in norcal). You paddle out with your mask on? I wear mine on the drive out, that way people see how cool I look. do you even dive, bro? While I’m paddling at a new spot, I often keep my face in the water to look for structure, schools of fish, etc on my swim out to where I’m planning to dive. If I see something that looks good, I stop and dive it. If I pull up onto the banks board or flip to swim on my back, I still tend to stick my head back in for a look every 30 seconds or a minute. At that point, I usually just leave my mask in place (especially if it’s tinted, since it helps block sun glare). If I’m at a spot I’m familiar with and I know exactly where I’m going, it’s a different story. Ah I see makes sense thanks for the replies. I can see how the tint would help looking through the glare at spots, especially shore diving. I am usually just staring at my fish finder and for kelp on the surface when I am on the yak. There have been a few/many times when I've thought, "A tinted mask wold be great right now." I applaud your efforts to get your gear dialed in. Lately, I've just been ignoring the fish I would have eaten, before. It seems to be working. I think the main advantage is places like baja or Hawaii where underneath the surface 30 feet you feel like you still need sunglasses with light reflecting off the rocks. Or anywhere chasing pelagics in crystal clear water. I also had a guy down there tell me the tint helps the wary fish like wahoo and pargo not see your eyes. I know if you stare at pargo wahoo they instantly leave so it may have some truth.